The Montville Township First Aid Squad would like to congratulate the parents of Ayden Riley Velazquez, who arrived on November 10 at 2:50 AM and was born at 6 lbs 12 oz. 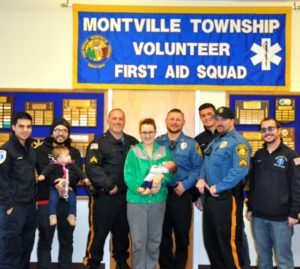 The Montville First Aid Squad would also like to express sincere gratitude to the Montville Township Police Department, who aided in the delivery of a healthy baby boy. We wish Ayden and his family all the best! Interested in reading more about what happened? CLICK HERE to read the TAPinto Montville article!